(Click to magnify) I don’t think I’m going to go into the business of building and selling 3D printers — I can’t build complete printers quickly enough to be competitive in the market. High-precision ball studs are $1.50 each. 12 are needed. 10mm diameter 15mm high N52 magnets are $2 each. These are the best you can get. 12 are needed. I also precisely build and sell assembled sets of magnetic zero-backlash arms complete with ball studs using the above parts. Each set of 6 will have a maximum variation of 50µm. I typically produce sets with less variation — 30µm is typical. The length of the arms from the center of one ball to the center of the other is about 288mm, which is the right size for a full-sized Kossel (~750mm high) printer. I also build them to 215mm lengths for Mini Kossel printers. I measure the arms with large calipers and mark their lengths on tape on each arm. A complete set of six, with CNC’d Delrin ends, is $75. I’ve also added two more sizes: 304mm and 360mm. I believe 304mm is a better match for “classic” Kossel printers with 360mm horizontal extrusions and 250mm beds. 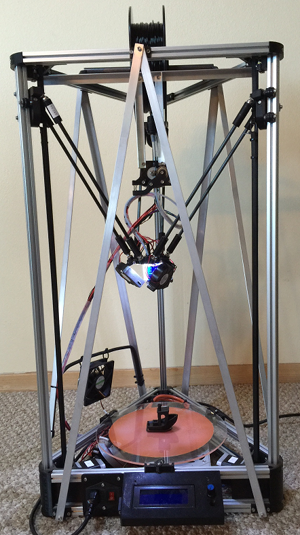 The 360mm arms are for printers with 300mm beds and they are a little extra at $80/set. If you need arms with a custom length, I can build them in lengths up to 505mm. They’re $115/set. If you’d like them built with 10mm CF tubing, it adds about $50 extra. US airmail postage is a flat $5. International airmail postage varies depending on the size of the package, but is typically between $9.50 and $24. Let me know what country you’re in and I’ll get you a quote. Send me an email to let me know what you’d like and I’ll send you a PayPal request. Here are the quick and easy auto-calibration instructions. 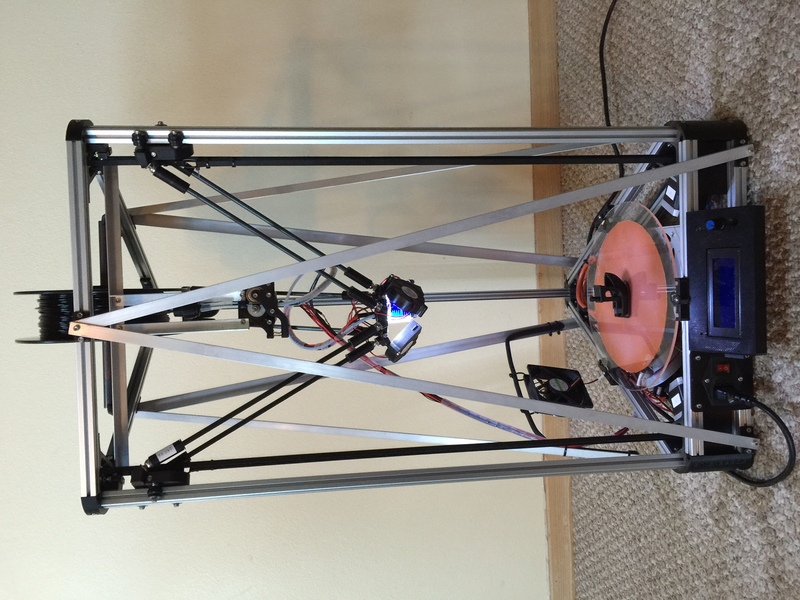 My latest printer design https://www.Kumu-3D.com maximizes performance and minimizes cost. You can build one for about $600 and its performance is right up there with the very best! If anyone is interested in building a KosselPlus, let me know and I’ll be glad to help you! It can print PLA, ABS, and most of the other filaments with an appropriate hotend. It is stiff enough to print at 90mm/sec or whatever your hotend is limited to. I typically print 50-100µm layers at 60mm/sec and do non-printing moves at 150mm/sec. Both the zero-backlash magnetic joints and A-bracing help with this. Print area is 250mm in diameter, and about 280mm high, though it tapers at the top. The power supply is located under the bed and has a power switch on the front. Software speed control for the PLA cooling fans. Bright white LED light ring on the bottom of the effector. Shane’s extruder is also top mounted, just below the spool. Fan for cooling the hotend. Mk8 drive gear for 50% extra torque in the extruder. Dampeners for the XYZ motor mounts for noise reduction. Sorbothane feet for noise reduction. Inexpensive DeltaPrintr POM carriage wheels. DRV8825 stepper drivers with 1/32 stepping for smoothness. In typical operation, the machine is so quiet it is difficult to hear it from a few meters away (except for the fans on the effector and hotend). The machine is so rigid that I calibrate it once, and it stays in calibration for months, even after taking it on car rides. The only plastic parts I didn’t design are Johann Rocholl’s frame corners and endstops, Shane’s extruder, and the holder for the LCD display. Includes versions for both E3D and J-Head hotends. Added a z-probe for auto-calibration. Here is a link to the rest of Johann Rocholl’s Mini Kossel OpenSCAD files (with my modifications). The effector works best with a E3D hotend. I replaced the cheap, noisy 12v fan in the power supply with a 24v one, which is more than powerful enough, and much quieter. I found that even with using 400 steps/mm and printing at 90mm/sec with 0.9°motors and 1/32 stepping, Repetier Firmware on an Arduino Mega is fast enough to keep up. When calibrating, I recommend using RC’s Marlin and setting the speed slow enough — even 1/4 speed, if necessary. Get 5 Geeetech DRV8825 stepper drivers — I have ordered at least 4 sets, and never received a set with more than 4 working ones! I’ve recently switched to using an AZSMZ 32-bit controller with Smoothieware. It is superior to an 8-bit Arduino. If using an 8-bit Arduino controller, then for initial calibration use these instructions and this version of Rich Cattell’s Marlin, with auto-calibration. It will save you a week’s worth of headaches! For production use the version of Repetier Firmware at the bottom of the page.